A giant monster known as "Gigant" is attacking the Earth. Bandai Namco’s teaser website launched last week is for a new, Experience-developed PS Vita “story dungeon RPG” called Ray Gigant, this week’s issue of Dengeki PlayStation reveals. Due out this summer in Japan, the game takes place in June 20XX, during which the Earth is on the brink of destruction by a giant monster known as “Gigant,” and three heroes must rise to the occasion to defeat him. The game is broken up into chapters that take place across three different settings. Your party is fixed at three members, and the battle system camera is set behind the party, unlike any Experience-developed dungeon RPG before it. The battle screen is described as similar to this Time and Eternity screenshot. Update 9:40 a.m.: More information has come in via [email protected]. First, details on the game’s three protagonists. The game is broken up into chapters, with one protagonist per chapter. Protagonist: Ichiya Amakaze (voiced by Atsushi Abe) – A wholesome junior high school student. However, when Gigant attacks and destroys Tokyo, he has his awakening. His thee song is by T.M. Revolution. Mana Isano (voiced by Rumi Okubo) – A junior high school girl and childhood friend of Ichiya. Kazuomi Miwa (voiced by Takuya Eguchi) – A serious boy who’s hard on Ichiya, but is still his partner in arms. Protagonist: Kyle Griffin (voiced by Wataru Hatano) – A British 17 year-old boy with a distorted personality and no love from his parents. His theme song is by Faylan. Protagonist: Nil Phineas (voiced by Yoshino Nanjo) – A 16 year-old girl whose nationality is unknown. She protects the islands of the Caribbean from Gigant. Her theme song is by her voice actress. The game’s main visual shows Ichiya and Kyle fighting, indicating the humans might not all be on the same side. 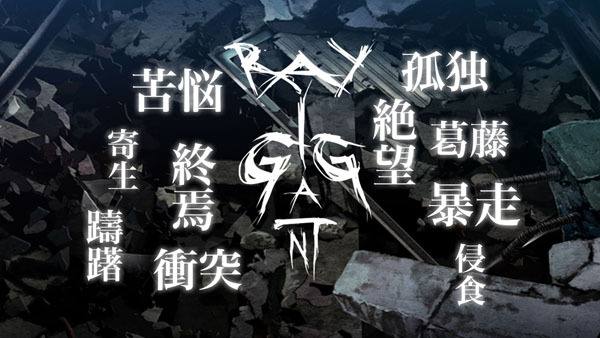 As far as gameplay goes, Ray Gigant is a dungeon crawling RPG, but story emphasis means that party is dictated by the plot. Dungeons will have gimmicks that force players to act strategically. 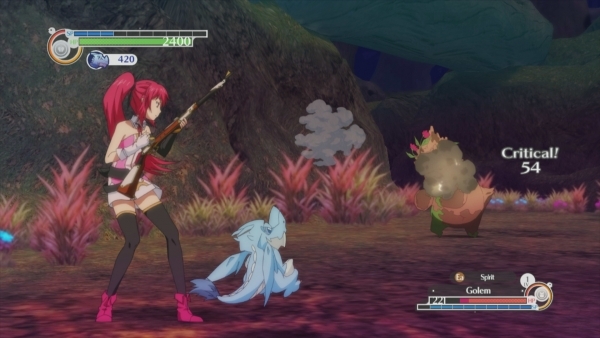 Both enemies and allies are animated during battle, and the combat system may not be purely turn-based in the traditional sense. Though characters’ back-stories and voices are set, players are still able to decide manually how to raise them as they level up. Mito first got in touch with Experience in April 2012 after playing and enjoying the Demon Gaze. Since Experience was busy around that time, our next talk was pushed to August 2013. Since it was our first time planning a project targeting junior high school students, planning and gameplay design has been difficult to tune. Of course, the scenario is an important focus, and we’re aiming for something Students of the Round-like. Our systems are unlike our usual ones. There will be some hack a slash elements, but the game is closer to a regular RPG. The number three is prominent throughout the game in things such as the settings, protagonists, etc. The protagonists are rivals with one another at times. Each area has different enemy designs. Each protagonist not only has their own theme song, but their own BGMs, as well. Different from your standard dungeon RPG, this is not a map filling game like other dungeon crawlers. Things such as viewing size different between party and enemies will be in a third-person view for better perspective. Battles are command-based, but there are also elements that are not. Ichiya is a very archetypal protagonist, meaning his story has him awakening to and getting swept up in things. Kyle is part of a civilian militia and Nil is part of an anti-Gigant team, making them most knowledgeable about its threat. While we can’t go into detail yet, character customization will be considerably different. You can only have three people in a party because it’s the simplest amount of people to enjoy a party battle.